The success of Temple Run, a simple 3D endless runner created by the husband and wife team of Keith Shepherd and Natalia Luckyanova, has been nothing short of astounding. Since its 2011 release the game has grown into a casual gaming phenomenon, as definitive a mobile entertainment experience as Angry Birds or more Angry Birds. That overwhelming success has led to a flood of third-person endless running games in iTunes and Google Play, developers scrambling to emulate and enhance the formula Imangi Studios established. Temple Run with guns. Temple Run in space. This flurry of jumping, sliding and turning titles introduced some interesting new mechanics to the genre, but none of them managed to gain a fraction of the fame enjoyed by the original. You know what Temple Run is missing? Kids with guns. Enter Temple Run 2, swiping some of the best features of the endless runners that followed in its predecessors' wake to create what could be an even more untouchable experience. You Can Finally Stop Playing Temple Run. Temple Run 2 Is Coming Out. The core game remains the same. You're a generic Indiana Jones, unable to resist the allure of a shiny golden idol, unmindful of the millions upon millions of deaths that occurred the last time you decided to remove a religious icon from an ancient temple. At least you've given up on jungle trails filled with angular corridors. The temple you're fleeing through this time is a gorgeous fantasy affair that winds though misty mountaintops. There are hills here, and stairs. Zip lines connect scattered skyways, giving way now and then to mine cart rides through the innards of mountaintops. It's a more organic experience, brought to life through lovely HD graphics that make the first run seem primitive by comparison. Some of the sights are so lovely they've killed me, drawing my attention away from the ape escape in progress. With one giant angry gorilla in hot pursuit (replacing the original pack of angry monkeys) you take to twisting paths, swiping up to leap, down to jump, left and right to turn and from side to side to dodge. You cannot win. There is no escape. Your only goal is to die with enough coins to upgrade your abilities so the next run lasts a little bit longer. Thanks to an enhanced progression system that feels pieced together from games I've played since Temple Run struck, those coins are much more important the second time around, used to unlock and upgrade the skills of each of the game's initial four characters—Guy Dangerous, Scarlett Fox, Barry Bones and Karma Lee. Along with multi-tiered abilities, each adventurer can be assigned a special skill that can be activated once the power meter on the top left (replacing the original coin meter) has filled. Briefly become a living coin magnet, or activate boost to skate down winding paths at dizzying speeds. Having a fresh power at your fingertips at all times adds a little strategy to the mix. It's always nice to have options when your gorilla food potential is rising with each passing second. Borrowing a page from just about every running game these days, Temple Run 2's random list of achievements has been replaced with a series of three goals to aim for during your run (running a certain distance without grabbing coins, surpassing a target score, etc.). Each time you fulfill the conditions for one, another slips into place for the next trip down monkey murder lane. 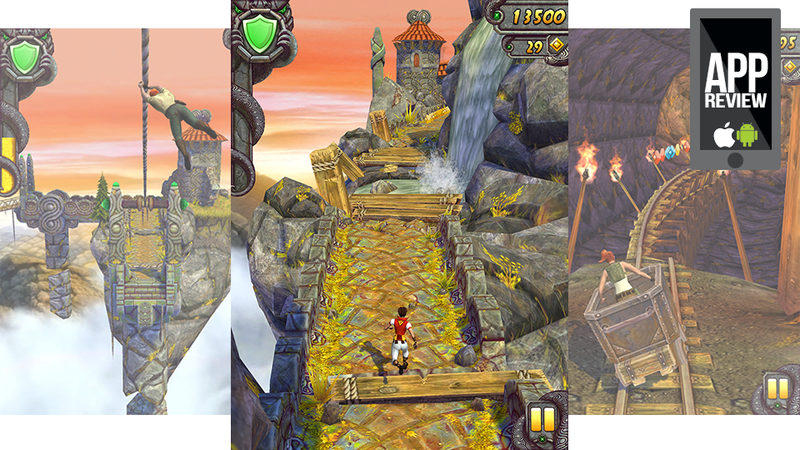 With all the graphic and mechanical enhancements, the heart of Temple Run beats true in Temple Run 2. Simple and responsive touch screen controls coupled with the natural urge to constantly improve make it far too easy to grab for that golden idol as soon as the previous run ends. One session flows into the next until suddenly your coworkers are banging on the bathroom door to make sure you haven't died in there. Imangi's Keith Shepherd told me during an interview earlier this week that the goal with Temple Run 2 was to make a game that was "bigger, better and more awesome" than the original. The team (now with five people instead of two) rebuilt the game engine from scratch, resulting in a fresh-feeling game that's as distractedly attractive as it is devilishly addictive. It is a bigger game. The addition of powers and skill progression give the sequel a goal beyond simple survival, and that's definitely better. As for more awesome, let's not push it. I'll check back when Temple Run 2 matches the more than 170 million downloads of the first game. Until then "just as awesome" will have to do.